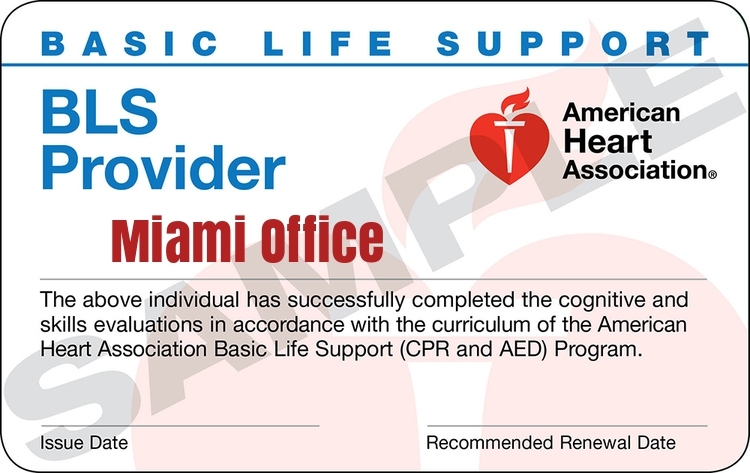 Remember - All of our American Heart Association (AHA) classes follow the new protocols and the student receives an official digital ecard as your certification card. We have 20 cool paramedics and nurses as instructors and have offices in West Palm Beach, Miami, Pompano, Tallahassee and Fort Lauderdale and teach in Miami Dade County, Broward County, Palm Beach County and Martin County, FL areas. This is at our Miami Office. 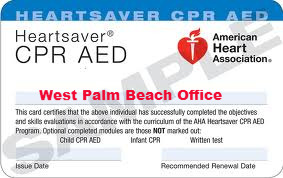 It is an official American Heart Association Healthcare Provider BLS (cpr and aed) class that includes adult, infant and child cpr, using an aed, heimlich, choking, 1 and 2 person cpr and aed and bag valve mask, barrier and advaced airway and it is approx 3 hours 15 min long. It also includes a 25 question written test at the end of class. It is recommended to have an official American Heart BLS book. 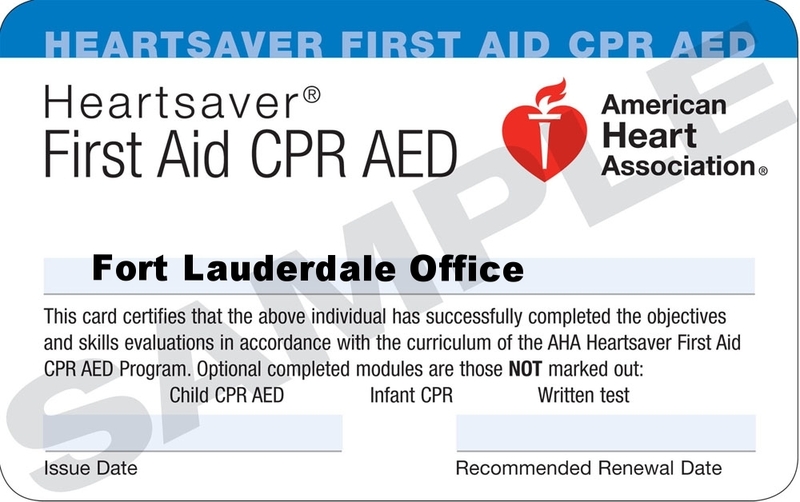 You can also review our free study guide and videos at www.cprflorida.net/cprreview for the class. 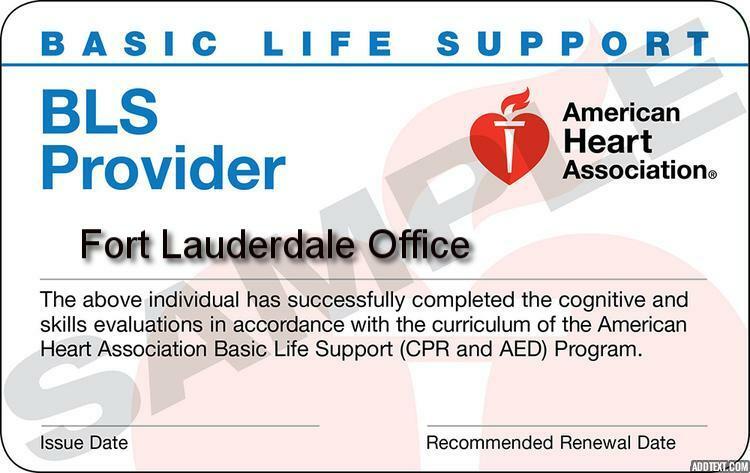 In July of 2016, the American Heart Association Changed the wording from "Healthcare Provider BLS" to just "BLS" Two year AHA BLS ecard given to you the same day after the training and your written test. First time or Renewals, same price. This is at our West Palm Beach Office. 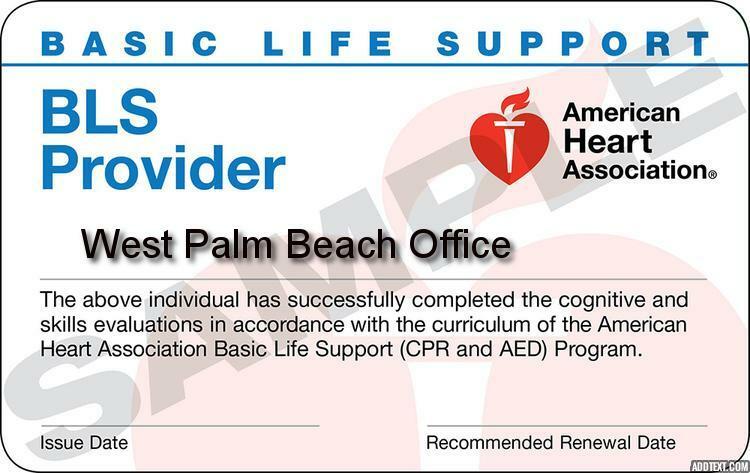 It is an official American Heart Association Healthcare Provider BLS class that includes adult, infant and child cpr, using an aed, heimlich, choking, 1 and 2 person cpr and aed and bag valve mask, barrier and advaced airway and it approx 3 hours and 15 min long. It also includes a 25 question written test at the end of class. It is recommended to have an official American Heart BLS book. 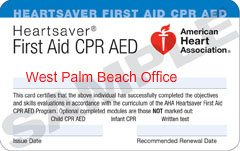 You can also review our free study guide at www.cprflorida.net/cprreview for the class. First time class is $200 cash or check only. Renewals, with valid card (not expired) is $150 cash or check only. Note that you must also pay a $4.00 acls registration fee online as well before the class. Sign up for either class here. 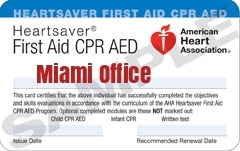 Official aha card or ecard given to you the same day after your training. *Pick "See More Classes" above to see a lot more classes listed. If you need a private or group class, please mail us at info@cprflorida.net. 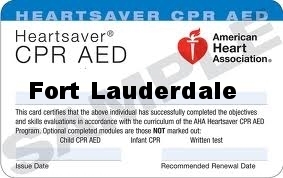 Main cities where we ins truct cpr, aed, acls, pals, bloodborne pathogens, first aid and healthcare provider bls classes: west palm beach fort lauderdale davie coral springs miami boca raton jupiter weston deerfield dade broward palm beach county miami dade boynton beach delray beach wellington gardens port saint lucie fort pierce and other areas in south florida.